No photo for today; just a tale of how easy mistakes are to make during this digital age. I normally don't make mistakes like this- as a matter of fact, it was the first time I EVER put a folder in a folder where it didn't belong - but mistakes happen when you're tired. I ALWAYS back up my raw files to DVD 1st thing before I do anything else with my CF Cards- so all was not lost; but the time it took to fix them all again was. I share this with you as a "how not to do things" warning! things like this can happen to ANYBODY. 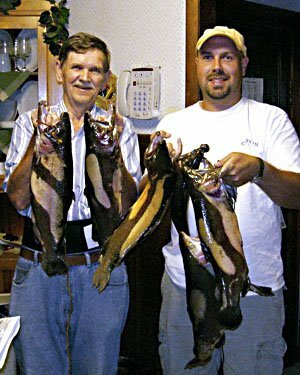 My father n law and Brother n law with their "trophy " fish. The largest golden trout was 22 inches and wieghed 5lbs.